Plastic and stainless bench, bowl and floor scrapers. Spare blades for floor scrapers. 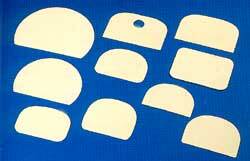 Special plastic scrapers printed with your own logo or message.